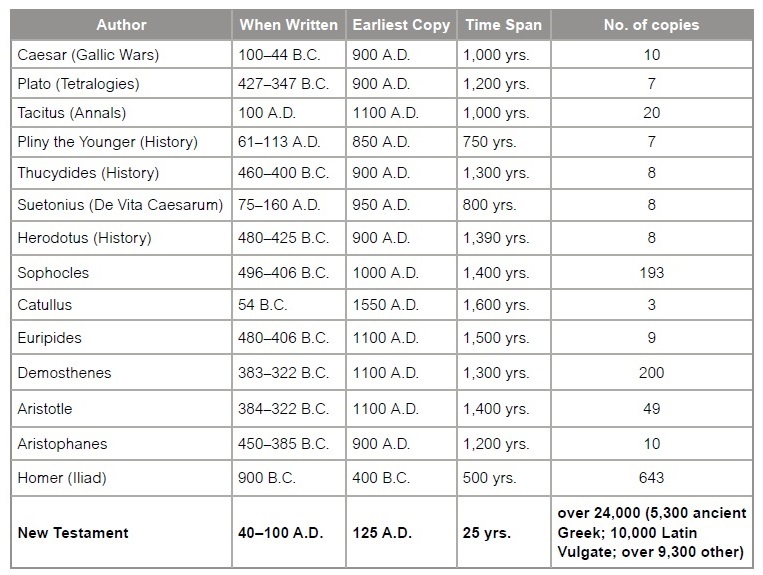 Measured by these standards, there is no other book in the world that even comes close to the textual reliability of the New Testament of the Bible.3 Note in Table 1 at the end of this lesson,4 that those who made the earliest copies of the New Testament were either contemporaries of, or only a few generations removed from, the original writers. Notice also the number of copies that were made within that period of time. The difference between the New Testament of the Bible and other ancient works is astounding. • Does the information you have studied today change the way you view the Bible? • If so, how? If not, why not? • Josh McDowell, Evidence That Demands a Verdict, Thomas Nelson, HERE’S LIFE PUBLISHERS, San Bernardino, Ca, 1972. 1All–Time Best Selling Books and Authors. (Internet Public Library, © 1995–2006 The Regents of the University of Michigan). (http://www.ipl.org/div/farq/bestsellerFARQ.html). Retrieved November 13, 2006. Categories: reliable, scribes, Uncategorized, word | Tags: bible, divine, reliable, word of God | Permalink. As a Muslim I found this a very interesting read. Though I must dispute some of your claims. With regards to your claim about the continuity and textual similarity to the organically document as unsurpassable, what about The Qur’an? It has remained in it’s pure form since it was revealed. In the language it was revealed in. This is the way it was and is read today. I find it astounding that a ‘book of God’ can be written by 40 authors, yet claimed to be better in terms of textual accuracy than a book which has not been altered, and compiled by one scribe. It simply does not make sense. Surely The book of God must come from God himself. The Qur’an is the direct and unaltered word of God, memorised by The Prophet Muhammad and his companions, and then compiled into one book. Every copy today is identical to that book. How can you claim The Bible to be the pure command of God, when there are multiple copies in existence? When it is not available in it’s pure form? When The Pope, as a head of a religion for example, reads from The Latin Bible. Did Jesus (may peace be upon him) speak Latin? I see no continuity in The Christian Bible. Of course undoubtebly it contains truths, as does the Old Testament. As a Muslim I believe that these scriptures were once pure and unaltered, hence some agreements can be found with The Qur’an. The same God after all, sent all three books to man. But it is the hand of man that you praise, the 40 or so authors, that invalidates the text. This is why The Qur’an was sent down, to be the final unaltered message as had been delivered to mankind as Torah and The Bible before they were altered. Thank you for reading, and I hope this provokes some thought, after all if we don’t question ourselves and why we believe what we believe in, and whether it is right or not, there really is no point in believing! Thank you for response. You have articulated several important issues. In general, I am familiar with your thought that the Bible has been compromised, and that the Qur’an has remained in its pure form from its inception. However, I respectfully submit to you that such a position is not consistent with the facts. Much has been written on this subject, both by Biblical scholars and Islamic scholars. I will not add to this particular discourse in my response, but I will cite a brief response which can be found at this link – http://www.gotquestions.org/errors-Quran.html. What I would like to address is your concern that a divine manuscript authored by God through 40 individuals is less trustworthy than a manuscript authored by a single individual. Consider this simple illustration. Suppose you asked a single person to think of a number between 1 and 10. The person might claim that God gave him a number, but then many people throughout history have claimed that God spoke to them. Now suppose you asked 40 different people (who were not in contact with each other) to come up with a number, and they all came with the same exact number. Such a thing would be beyond probability. It would be super-natural, beyond natural explanation. That is point we’re making when we write that the Bible was written by 40 different people, and yet the result is one story with perfect harmony centered about one character. It is as if each of them came up with the same number. A single musician does not need a conductor to play a beautiful piece of music. But an orchestra cannot play a beautiful symphony without the direction of a conductor. The harmony, the textual and archeological reliability and the prophetic record of the Bible all indicate that its composition was directed by a single magnificent divine Being.